Black pepper(Piper nigrum L.), the king of spices, belongs to the family Piperaceae. area under pepper in the world but its share of production is only 26.6 %. horizontally from the modes and do not attain length, but the fully-grown vines completely cover the standard presenting the appearance of bush. The leaves are broadly lanceolate, but wide variations occur in leaf shape and are arranged alternately. The inflorescence is a catkin produced at the nodes opposite to the upper leaves. Flowers are very minute. Monoecious or dioecious or hermophrodite forms occur in different varieties. The fruit is a single seeded berry, which has a thin,soft pericarp surriounding the seed. It takes approximately six months to mature after flowering. Sometimes, spike shedding occurs to the extent of 14 to 65 % causing considerable loss. Spraying of IAA 50 ppm or planofix 50 ppm and orzinc 0.5 % at the time of berry setting stage reduces spike shedding. Pepper is a humid tropic plant, which requires adequate rainfall and humidity. The hot and humid climate of submountanous tracts of Western Ghats and Eastern Ghats is ideal for its growth. It grows successfully between 20o north and south latitude and from sea level upto 1500 meters above MSL. The temperature ranges between 10o and 40oC. A well-distributed annual rainfall of 125-200 cm is considered ideal for pepper. Majority of the cultivated types of pepper are monoecious. Over 75 cultivars of pepper are being cultivated in India. Karimunda is the most popular of all the established cultivars of pepper among the growers of Kerala. The other important cultivars are Kottanadan, Narayakkodi, Aimpiriyan, Neelamundi, Kuthiravally, Balancotta, Kalluvally, Malligesara and Uddagare. 2. Panniyur-2 (Krishna) Open pollinated seedlings of Balankottah. 4.5 kgs green berries per vine, 2828 kg/ha, shade tolerant, medium sized berries, dry recovery: 35.7%, oleoresin: 10.9%, piperine: 6.6%. 7. Subhakara A selection from Karimundu (K.S.27) 4.2 kgs green berries per vine, 2677 kg/ha, dry recovery: 35%, piperine: 3.4%, oleoresins: 12%, essential oil: 6%. 8. Panchami A selection from Aimpiriyan coll. 812. 5.2 kgs green berries per vine, 8320 kg green pepper/ha, piperine 4.7%, oleoresins: 12.5%, essential oil 3.4%, dry recovery 34.0%. 9. Pournami A selection from Ottaplackal type coll. No. 812. 4.7 kgs green berries per vine, 7526 kg of green pepper/ha, Piperine 4.1 %, oleoresins 13.87, Essential oil 3.4%, dry recovery 31%, tolerant to root knot nematode (Meloidogyne incognita). Pepper is propagated by cuttings raised mainly from the runner shoots. Cuttings from the lateral branches are seldom used, since in addition to reduction in the number of fruiting shoots, the vines raised from them are generally short lived and bushy in habit. However, rooted lateral branches are useful in raising pepper in pots. Runner shoots from high yielding and healthy vines are kept coiled on wooden pegs fixed at the base of the vine to prevent the shoots from coming in contact with soil and striking roots. The runner shoots are separated from the vine in February-March and after trimming the leaves, cuttings of 2 to 3 nodes each are planted either in nursery beds or polythene bags filled with fertile soil. Cuttings from middle 1/3 of the shoots are desirable as they are high yielding. Adequate shade is to be provided and irrigated frequently. The cuttings will strike roots and become ready for planting in May-June. Well drained level land and hill slopes are suitable for growing pepper. When grown on a slopy land, the slopes facing south should be avoided and the lower half of north and north eastern slopes are preferred for planting: so that the vines are not subjected to the scorching effect of the sun during summer. Pepper is grown as monocrop as well as a mixed crop. Large scale cultivation of pepper as monocrop is done on hill slopes by clearing jungle lands and planting standards for the vines to climb on. As a mixed crop, it is grown with arecanut, coconut, mango, jack etc. where these trees serve as standards for the pepper vines. Pepper is also a suitable intercrop in coffee estates where the shade trees as good standards for them. Pepper cuttings are generally planted with the onset of the southwest monsoon. Planting can also be done during the north east monsoon wherever it is regular and well distributed. When pepper is grown as pure crop, pits of 0.5 m cube are dug at a spacing of 2.5 x 2.5 m and Erythrina stem cuttings of 2m length or its two years old seedlings are planted on receipt of early monsoon showers. With the onset of regular rains, 2 or 3 rooted cuttings are planted around the base of the standard nearly 30 cm away. But in the case of coconut and arecanut which have a thick intercoiled root net close to the trunk, pepper cuttings are to be planted 100 to 120 cm away from the tree trunk which are about 8 to 9 m high. Initially, the vines may be allowed to climb on a stick or pole about 2 m tall, which is tied to the trunk in a slanting position. After one year, when the vine has attained sufficient length it may be separated from the temporary stake and the lower leaves may be nipped off. A narrow trench of 15 cm deep and wide should be prepared from the base of the vine to the base of the tree trunk. The vine may be placed in the trench in such a way that the growing tips it tied to the trunk while the other parts of vine is covered with the soil. A small ridge is formed over the trench which should not be disturbed while doing intercultural operations to the palm. As the cuttings grow, the shoots are tied to the standards as often as required. The young vines should be protected from hot sun during summer months by providing them with artificial shade. Regulation of shade by lopping the branches of standards is necessary not only for providing optimum light to the vines but also for enabling the standards to grow straight. Adequate mulch with green leaf saw dust or coir dust or organic matter should be given towards the end of northeast monsoon. The base of the vines should bot be disturbed to avoid root damage. During the second year, practically the same cultural practices are repeated. However, lopping of the standards should be done carefully from the fourth year onwards, not only to regulate the height of the standards, but also to shade the pepper vines optimally. Excessive shading during flowering and fruiting encourages pest infestation. Pruning the top of the vine after it has reached the required height i.e. 6 m is normally practised when it is trained on standards like silver oak, coconut, arecanut for convenience of picking. From the fourth year, usually two diggings are given one during May-June and the other towards the end of southwest monsoon in October-November. Growing cover crops like Calapogonium mucanoides, Mimosa invisa are also recommended under West Coast conditions. Pepper vines start yielding usually from the 3rd or 4th year. The vines flower in May-June. It takes 6 to 8 months from flowering to ripening stage. Harvesting is done from the November to February in the plains and January to march in the hills. When one or two berries on the spike turn bright or red, the whole spike is plucked. Berries are separated from the spikes by rubbing them between the hands or trampling them under the feet. After the separation, the berries are dried in the sun for 7 to 10 days until the outer skin becomes black and shrunken and assumes the characteristic wrinkled appearance of commercial black pepper. For making good quality black pepper of uniform colour, the separated berries are collected in a perforated bamboo basket or vessel and the basket with the berries is dipped in boiling water for one minute. The basket is then taken out and drained. The treated berries are sun dried on a clean bamboo mat or cement floor. White pepper of commerce is prepared by removing the outer skin and the pulp below it before drying the berries. Spikes with fully ripe berries are filled in gunny bags and steeped in flowing water for about 7 days. Outer rind of the berries is then removed by rubbing them with hands in a bucket of water and further cleaning the seeds with fresh water. The cleaned seeds are dried for 3 to 4 days. The seeds which are now dull white in colour are further cleaned by winnowing and polishing them by rubbing with a cloth. The recovery of white pepper is about 25 % of ripe berries while that of black pepper is about 33 %. Pepper vines attain full bearing stage in the 7th or 8th year after planting and it starts declining after 20 to 25 years and replanting has to be done thereafter. 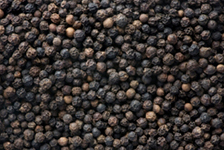 One-hectare plantation of 7 to 8 years old gives about 800 to 1000 kg of black pepper. (Cydia hemidoxa) Caterpillars bore into the tender shoots turning them to black and drying up. Spray endosulfan 0.05% twice when new shoots emerge. (Liothrips karnyi) Thrips live in colonies within the tubular marginal galls induced by them. Such leaves become thick malformed, crinkled. Spray monocrotophos 0.05%. (A spidiotus destructor) Drying of the infested portion of the vine. Spray dimethoate 0.05% at 15 days intervals. (Phytophthora capsici) Pathogen infects leaves, spikes, collar region and roots. Collar infection causes sudden collapse of the vine, other symptoms are foliar yellowing and defoliation. High soil moisture and relative humidity during monsoon favour infection and spread. Removal of the infected dead vines and burn them, provide proper drainage, avoid damage to root system and stem of vines. Spray vine with 1% Bordeaux mixture and 0.25% Ridomil ziram alternatively and drench the basin with the same chemical twice, once before monsoon and one after monsoon. gloeo-sporioides) Brown sunken patches seen in the young betties, develops characteristic cross splitting and finally turn to black in colour and dry. Spray 1-% Bordeaux mixture. (Soil borne fungi Fusarium sp., Rhizoctonia sp., Pythium sp., Diplodea sp., nematodes- Radopholus similis, Meloidogyne incognita) During dry months, floiar yellowing defoliation and dieback symptoms appear in vines and during monsoon some of the affected vines recover and putforth fresh foilage and again they show decline symptoms during dry monthos, thus gradually loosing vigour and productivity. Remove the severely affected vines, treat the plabting pit with phorate @15g or carbofuran @ 50g at the time of planting, and apply phorate @ 30g or carbofuran @100g/vine twice in a year.